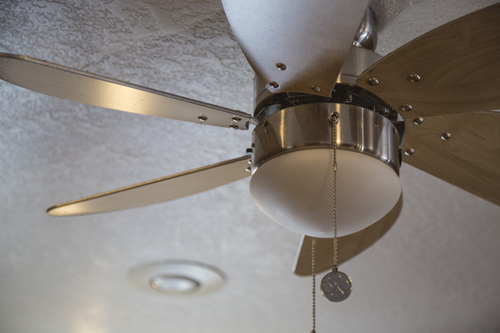 If you're looking to reduce your home's energy cost, our Valley electricians recommend using ceiling fans to stay cool. Ceiling fans can easily be installed in all central areas of the home including bedrooms, living rooms, dining rooms, and kitchens. With many styles and sizes available, they can even include lighting to help keep you cool and comfortable in all rooms of your house. This also allows you to keep your A/C at an energy-efficient, budget-friendly level. Most ceiling fans on the market today are extremely energy efficient, using only as much energy as a 100 watt light bulb. Our experts recommend buying ENERGY STAR ceiling fans because they offer a two-fold benefit: reduced operation energy use and reduced greenhouse gas emissions. In fact, fans with the ENERGY STAR stamp of approval can also help lightbulbs last longer, so you won't need to buy as many bulb replacements over the life of the fan. And you won't sacrifice on design either. Many certified ENERGY STAR lighting kits feature trendy, decorative blades and motor housing for a more modern look. It is recommended to have a professional dismantle existing ceiling fans and install new ones instead of trying to complete this work yourself. Not only is it dangerous to handle the live electricity feeding to these units, but many home warranties will also become void if electrical work is done incorrectly. Proper handling is a must when live electrical wiring is present to protect your home from an electrical fire. If you have an existing ceiling fan that is not performing at its best, you can ask our residential electrical contractors to come visit your home in the Metro Phoenix-area for an electrical troubleshooting service. If we find that the ceiling fan motor or wiring is faulty, we can repair and replace the unit for you at an affordable rate. Stay cool and save energy in Phoenix, AZ by having our experts can help you select and install a stylish ceiling fan fixture. Schedule an in-home consultation for ceiling fan installations with The Mighty Electricians today!